With only a few weeks left before the National Science Fair, Emily Sue volunteers to take Homer to buy a suit. In the car ride to the suit store, Homer asks—as casually as he can—about Dorothy. Emily Sue informs him that Dorothy isn’t interested in Homer, even though she feels bad that Homer is angry with her. Homer tries to act like he doesn’t care about Dorothy, but Emily Sue isn’t fooled. Even after his moral epiphany at the end of the last chapter, Homer isn’t completely grown up. He seems no closer to getting over his feelings for Dorothy, even though she continues to show no signs of romantic interest in him. Emily Sue and Homer drive to a men’s store in Welch called Philips and Cloony. Inside, he finds that the clerk knows Jim—a regular at the store. The clerk enthusiastically helps Homer find a beautiful suit. While he’s near the store, Homer is surprised to run into O’Dell, who’s gone into town to sell more ginseng. O’Dell encourages Homer to buy his new suit, and Homer does so. Homer gets a pleasant reminder that his relationship with his brother isn’t entirely antagonistic—here, Homer appears to get better service because Jim patronized Philips and Cloony so regularly. In contrast to his usual thriftiness, Homer splurges on a new suit. While Homer is in Welch, he sees a crowd, and posters saying, “Jack Kennedy for President.” A bystander informs Homer that Kennedy will be making a speech in Welch in less than an hour. Homer finds Emily Sue, and they decide to stay for the speech. Emily Sue is shocked to see that Homer has purchased a bright orange suit, with O’Dell’s encouragement. In this welcome comedic section, we get a reminder that Homer, for all his growing intellectual and emotional maturity, is still a clueless kid in many ways. Before Emily Sue and Homer can argue about his suit, Kennedy arrives and begins speaking. Homer notes his beautiful brown tan. Kennedy talks about the legacy of Franklin Roosevelt and the New Deal, and promises to bring prosperity and jobs to West Virginia. Homer notes that the crowd seems unenthusiastic, and remembers his father complaining about Roosevelt for his socialist policies. It’s not totally clear where Hickam’s politics lie, but he makes it clear that most of West Virginia doesn’t support liberal policies. FDR and Kennedy are now generally considered great presidents, but at the time they had their detractors like any politician. At the end of the Kennedy’s speech, he takes questions from the audience. Homer raises his hand, and because of his shocking orange suit, Kennedy calls on him. Homer asks Kennedy about space exploration, and suggests that Americans should go to the moon and mine it for energy. Kennedy nods, and suggests that perhaps Americans should explore the moon. The crowd cheers. At times, Rocket Boys blurs the line between fiction and fact (something which Hickam acknowledges openly in the introduction to his book), so we must wonder if Hickam really did meet JFK and give him an idea for the Space Race. The entire episode seems incongruous with the rest of the memoir, especially because Kennedy is such a recognizable historical figure. In any event, it’s important to keep in mind that Kennedy’s initiative played a major part in sending a manned mission to the Moon in 1969. Homer and Emily Sue leave the crowd, and Emily Sue insists that Homer must replace the suit before the store closes. Homer reluctantly replaces his orange suit with a more modest blue one. Back in Coalwood, Homer Sr. and Elsie compliment Homer on his appearance in the new suit. Homer mentions that he asked Kennedy a question about space exploration, and Homer Sr. mutters that Kennedy is a “pinko.” Homer retires to his room, noting that he’s kept one part of his original outfit: a bold red tie with a cardinal embroidered on it. The tie will help Homer stand out at the Science Fair, and bring some “BCMA style” to the competition. Emily Sue acts like Homer’s mother, giving him clothing advice and scolding him for his foolishness when it comes to fashion—although it seems that his orange suit is what made him stand out to JFK. Homer Sr.’s critique of Kennedy reminds us that he’s a fervent Communist-hater. “Pinko” was a common term of abuse for Communist sympathizers at the time—but also an insult directed at homosexuals, perhaps suggesting another kind of lifestyle Homer Sr. would disapprove of. Arn, Jackson. "Rocket Boys Chapter 24: A Suit for Indianapolis." LitCharts. LitCharts LLC, 20 Nov 2015. Web. 18 Apr 2019. Arn, Jackson. "Rocket Boys Chapter 24: A Suit for Indianapolis." LitCharts LLC, November 20, 2015. 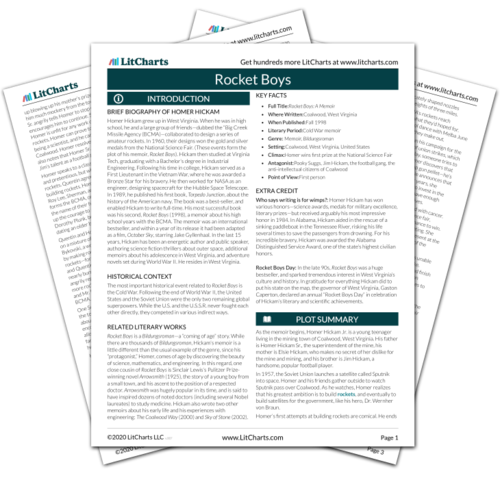 Retrieved April 18, 2019. https://www.litcharts.com/lit/rocket-boys/chapter-24-a-suit-for-indianapolis.